The second Love Under17 Live event took place on November 20, 2005. The first one took place on February 5, 2005. This was an event organized by Hiori, and friends, where several cosplayers sing Under17 songs. But Hiori wasn't able to participate in this event. Since I had a baseball game earlier, I was only able to watch the second half of this event. There were around 40 to 50 people in the crowd when I arrived. I went to watch Saaya, and this was her 18th singing event. Saaya sang 3 songs, but I was only able to see her sing "Kagayaki Cylume" with Morinaga Haru (a duet) and "Kujibiki Unbalance" (solo). She said she had also sung "Popotan Kiss" (solo) in the first half of the event. For the duet, Saaya wore a very frilly white dress. For "Kujibiki Unbalance" she wore a pink maid outfit. 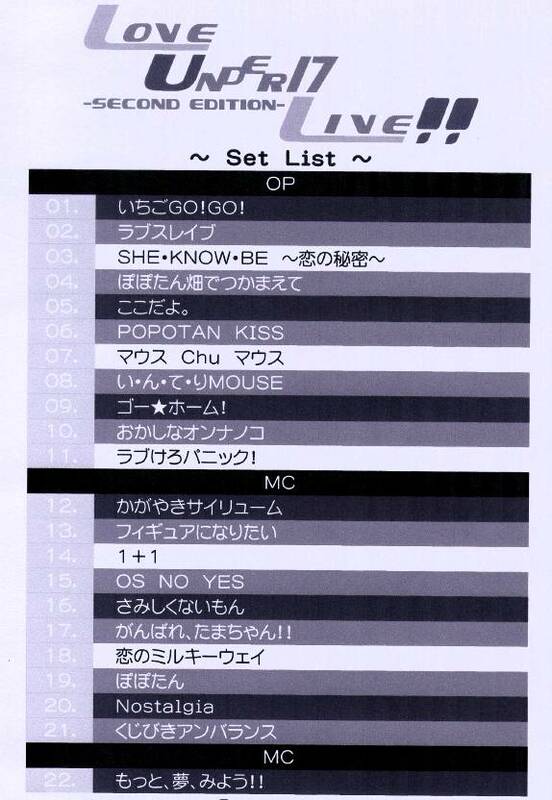 There were also three songs sung by everyone, "Ichigo Go Go", "Motto Yume Miyou", and "Tenbatsu". The full setlist was also passed out at the end of the event. Photos without flash allowed. Video and audio recording not allowed. I used my 20D, and took 901 photos, with 345 of them worth keeping. It was pretty dark and crowded, so I couldn't get many good shots. I only took photos of Saaya.